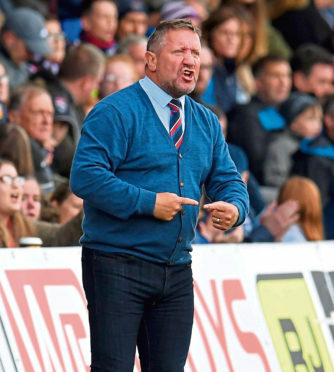 Caley Thistle manager John Robertson insists he is ‘supremely confident’ his side can still challenge for the Championship title this season. Jordan White’s goal gave Inverness a 1-0 win against title chasing Ayr United on Saturday and the victory means Caley Jags are 10 points behind leaders Ross County whose 4-0 defeat at Queen of the South was their second loss in a row. Inverness still have a game in hand on the Staggies, to be played at Ayr United on January 29, and the unpredictable nature of the division in recent weeks has strengthened Robertson’s resolve that Caley Jags can force their way back into contention. Saturday’s win was a welcome victory for Inverness following defeats to County and Queen of the South and Robertson believes his side is still in the hunt for the title. The Caley Thistle manager said: “We look at results elsewhere but try to focus on ourselves first and foremost. The frustrating aspect for us is had we taken the points our performances deserved against Queen of the South and Ross County, right now we could be sitting at a scenario of four teams on 36 points at the top of the table which would have been a fair reflection of how our season has gone. The Inverness manager hailed his side’s committed display in beating the Honest Men on Saturday. Both teams were understrength due to injury and suspension while Caley Thistle had also been beset by a flu bug within the dressing room last week and Robertson was pleased to see his players dig deep to take a vital three points. He said: “Saturday was a big result for us. Had we got the second goal it would have been more comfortable but we came through a potentially testing finish to take all three points. “We had Brad McKay and Shaun Rooney suspended, Nathan Austin, George Oakley and Angus Beith injured, and Jamie McCart climbed out his sickbed on Saturday morning to play. At 11am he wasn’t playing due to sickness and headaches but he got through the game. “Liam Polworth hadn’t trained all week due to the flu either. It was incredible and showed the resolve in the dressing room.